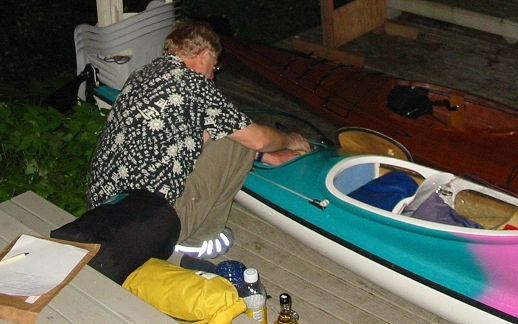 how to fit everything into the kayak he'll be using. 20 miles east to the Broughton Archipelago Marine Provincial Park. Randy and I are wearing dry suits we rented to try out on this trip. and paddled back to Telegraph Cove six days later. Go Barren spot where water taxi dropped us off on the north side of Crib Island. our first campsite. Here we're enjoying lunch. Go Randy and Jane inaugurate the new Osprey double that Randy built. Slick! Go Napping and reading were frequent camp "activities"
Go Bill and Mary-Carter in the Eddyline Whisper double. First Nation Settlement on Village Island. the government closed the school and residents relocated. weather, but at least we were able to get fresh water from a stream here. Go A stop on the way to our final camping spot at Hanson Island. a surprisingly fine dinner at the motel restaurant.